Sunbathe, stargaze and dine alfresco from not one, but three magnificent landscaped terraces in this unique and architecturally spectacular triplex Penthouse loft featuring superb luxury finishes and a sense of peace and tranquility so hard to find in New York City. From the moment you step off the key-locked elevator, you know you've arrived somewhere special. A gracious entrance foyer leads to a serene and expansive sky-lit Living room paved with Balsaltina stone floors and featuring high ceilings, exposed brick walls, and an oversized wood-burning fireplace with gorgeous limestone surround. Endless wall space with custom lighting provides the perfect backdrop for your art collection while nearby, a cozy sky-lit study with custom bookshelves is an ideal spot for reading books or enjoying moments of quiet reflection. At one end of the loft, a pocket door slides open to reveal the enormous Master Bedroom suite, a pin-drop quiet sanctuary bathed in natural light from oversized picture windows and featuring a large open sitting area, a separate dressing room with custom fitted closets, and a gorgeous en-suite bathroom with frosted glass and wood accents featuring a custom marble vanity, separate W/C, and a sumptuous steam shower with Hans Grohe fittings. At the opposite end of the loft, a pocket door opens to a sun-drenched guest bedroom replete with a custom built-in bureau, separate dressing area with abundant fitted closets, and a striking en-suite bathroom with soothing glass tiled walls, a custom double vanity, and a deep Kohler soaking tub with overhead rain shower. The luxury continues upstairs where a dramatic sculptural staircase leads to one of the most incredible entertaining kitchens in all of Manhattan illuminated by double-height windows and flanked on both sides by lush private outdoor terraces. Clearly designed by one who loves to cook, this amazing kitchen/dining room is graced with 20-foot ceilings and features an enormous butcher block center-island, deep Quartzite countertops, endless custom wood cabinetry and hidden pantry space, and top-of-the-line appliances including a super-sized Frigidaire refrigerator, dual Bosch and Fisher Paykal dishwashers, double Bosch ovens, a 6-burner Wolf range with grill vented to the outside, and a temperature-controlled wine refrigerator. On one end of this striking room a wall of floor-to-ceiling folding glass doors disappear, seamlessly connecting you to a large and fully irrigated landscaped terrace ideal for grand-scaled entertaining and featuring multiple seating areas, mature trees, perennial flowers, and custom lighting strategically placed to stimulate your senses. At the opposite end of the kitchen a dramatic glass door opens to a spectacular south-facing terrace decked in exotic Ipe wood and featuring a sumptuous sunken hot tub and hidden outdoor shower all screened with lush plantings providing the ultimate spa experience! Back inside, a staircase leads up to an additional guest bedroom overlooking both terraces which would make an ideal office or gym. 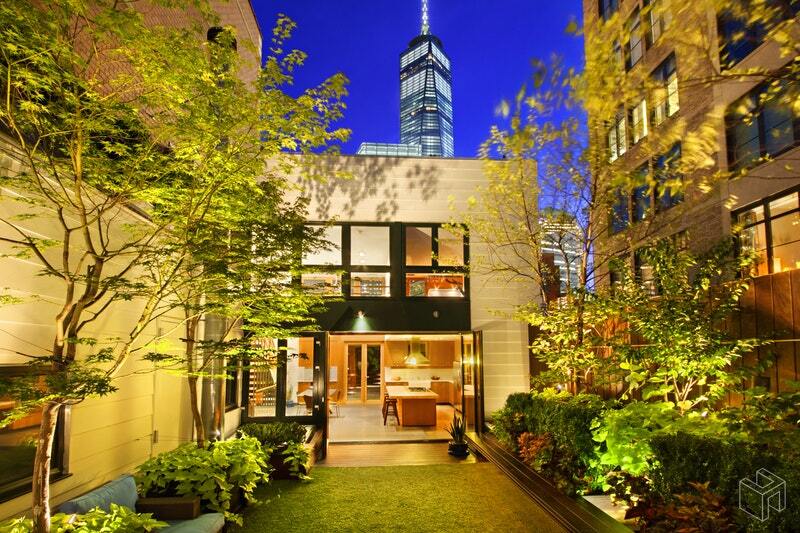 If that's not enough, the magic continues on the roof top of this amazing residence where you will find yet another private south-facing terrace perched in the sky, and offering breathtaking views of the Freedom Tower and the city skyline beyond.